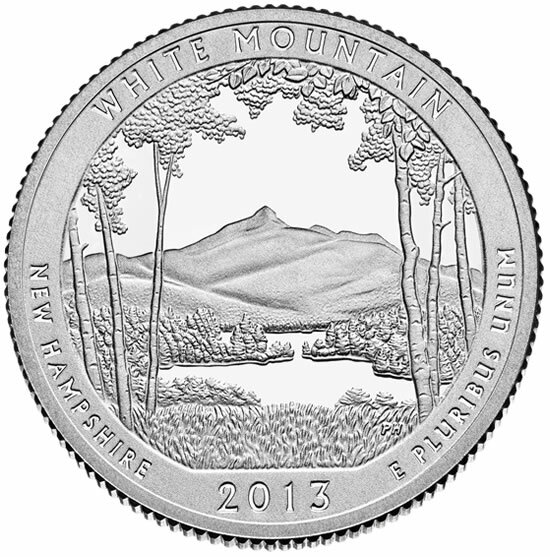 An official release ceremony for the White Mountain National Forest quarter will be held February 21, 2013, the United States Mint has confirmed. A coin exchange will follow immediately after the ceremony. Also released are details for a coin forum the U.S. Mint will host on the evening prior to the ceremony. The ceremony and coin forum are free and open to the public. 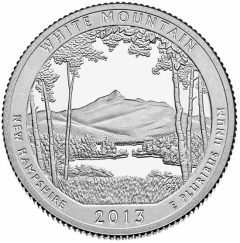 Issued as the sixteenth America the Beautiful Quarter and the first for this year, White Mountain quarters honor the national forest found mostly in the state of New Hampshire. The coin actually launched into circulation on Jan. 28, 2013, which is the same day the U.S. Mint began accepting orders for bags and rolls of the quarters. Quarter release ceremonies tend to last between 30 and 40 minutes. They offer entertainment and historical commentary from local dignitaries, and they provide an atmosphere that is well suited for children. Special guests include Governor Maggie Hassan and representatives from the offices of U.S. Senators Kelly Ayotte and Jeanne Shaheen. Immediately after the ceremony, children in attendance are usually given one of the new quarters while others can exchange cash for $10 rolls of the coins. There is limited onsite parking at Plymouth State University, Silver Center. Parking will be provided nearby and shuttle buses will be available to transport visitors to and from the event. Signs will direct visitors to the designated parking area for the event. Please arrive early to ensure everyone is accommodated. Coin forums offer a unique opportunity to express views, learn and ask questions about existing, new and upcoming United States Mint products. Upcoming quarter releases in 2013 celebrate Perry’s Victory and International Peace Memorial of Ohio, Great Basin National Park of Nevada, Fort McHenry National Monument and Historic Shrine of Maryland, and Mount Rushmore National Memorial of South Dakota. Each of these are expected to have an official release ceremony. As part of the America the Beautiful Quarter series, five quarters a year will launch until 2021 that have reverse designs emblematic of a national park or site in each U.S. state, territory and the District of Columbia. Check this site’s news section about quarters for information on past releases.